It always baffled me, before I got into movement as an occupation, why people with “bad knees” took up cycling. They have a so-called knee problem, and their solution is to take up a sport that involves putting MORE force through the knees! Why, I asked these earnest looking people, would you do that? “Because it doesn’t hurt my knees of course!” was the reply. “Erm… okay… so, you don’t have a knee problem then?” was my follow up question. “Of course I do! It hurts to run or play sport, all the time!” Now they’re getting frustrated. Confused, I stopped asking questions. There had to be more. To be clear, sometimes, as Freud said, “a cigar is just a cigar,” i.e. a knee, really is a knee; but usually, it’s something else. What do I mean? Well, I’m talking about knee dysfunction and pain, or any uncomfortable area of the body for that matter – neck, shoulders, low back, the list goes on. In my work as a physical therapist and movement coach, positive change in my clients has gone through the roof these last few years when I looked beyond the symptom being presented. The catalyst was connecting with the work of Prof Stephen Levin, Thomas Myers and Ian O’Dwyer. These three individuals have changed the game when it comes to understanding human anatomy and authentic human movement in my humble opinion. If you’ll let me outline their work, then we can get back to those pesky knees! ‘Tensegrity’ is a conflation of the words ‘tensional integrity,’ used to describe models like you see in the picture to the left. Continuous tension holds the components in a shape and structure, not the pieces of wood, or ‘solid’ items, but the elastic matrix of tension. 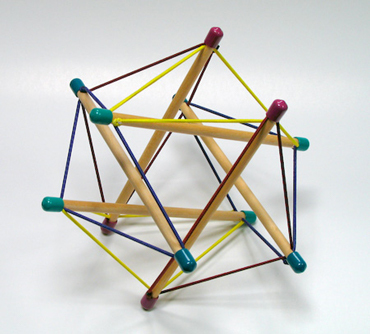 Prof Levin coined the term biotensegrity, to describe us mammals as a system. In other words, our bones aren’t the ‘structure’ of our body, but are, as Michol Dalcourt would say, “swimming in constant tension.” That constant tension is provided by our muscles and connective tissues. These are, in effect, our elastic. So, if we understand ourselves to be this elastic matrix of constant tension, you can see how important it is that our ‘elastic bands’ are not too short, too long or damaged in any way, as one piece of elastic with a knot tied in it will change the whole shape, structure and movement of the system. So, what are these elastic bands? Well, Thomas Myers entitles his book Anatomy Trains to describe these elastic bands. His dissections show how we’re not an organism of 600+ individual muscles doing individual jobs, but a system of far fewer chains of muscles and connective tissues, which are also joined to each other by more connective tissue. Whilst this is a massive over-simplification of his work, what you need to take away for our purposes today is that we have, for example, anterior elastic bands, posterior, lateral, deep and rotational. See the picture below as a visual representation of some of these. Now, check out how each line travels through the knee, and also right up to the head. One little clue on the path to that answer about our knee problem. Now consider how, for example, a restriction in the superficial front line would affect the amount of tension placed on the superficial back line. A shortening through the sternalis on the chest for example could create rounding/stooping at the shoulders, leading to an ‘over-lengthening’ in the superficial back line, which over a period of months and years mean an overworked chain of tissues and something; somewhere has to give. It could be the knee, it could be plantar fasciitis in the foot, it could be the lumbar area. You see what I mean? Up until 20 years ago, manual therapists were working on this idea to create results in their clients. No one had applied this to movement. Enter, stage left, one man we affectionately call ‘OD,’ Ian O’Dwyer (founding member of PTA Global). Coming from a horse racing background he’d worked with horses much of his life, helping them perform better. They couldn’t tell OD what they were feeling so he developed an intimate understanding of what they would. When he bought a PT studio, he applied his knowledge to humans and it seemed to work. Unknowingly, he’d been working with the integrated anatomy described above, so when he read Myers book, you can imagine the light bulbs going off! What I love about OD’s work is he brought this knowledge to life in actual movement, and other legendary people like Michol Dalcourt (another PTA Global founding member) have done much to further this area. If we pull the strands above together and sprinkle in some awesome coaching tools and skills like the PDQ and Kaizen 6 to connect and deliver the right experience for our clients, amazing things can happen! Look at these two photos above. This is a client of mine with knee pain beyond what most of us deal with – osteoarthritis in the knees, and in the shoulders and most vertebrae, making sitting down, reaching, bending, almost anything: really uncomfortable. The picture on the left is her at the start of the first session and she is reaching a painful point at this level of movement. The one on the right is a picture 40 minutes later in the same session! Yes, 40 minutes, not 4 months. What happened here? Well, her tissues were incredibly restricted throughout her body. Can you imagine the tension on the system if every piece of elastic has several knots tied in it? All the joints of the body will be pulled together, wearing down the menisci and discs and reaching bone on bone actions. So painful! We had her perform 4 fascial mobility movements, inspired by Ian O’Dwyer’s work. Just 4 simple actions, using the understanding of the body as a biotensegrity system and knowing how the chains of tissues run through human beings. This created enough space in her body, i.e. between each joint, to perform the same action to far greater range AND pain free. You can see video examples of fascial mobilisation at www.odonmovement.com. Through this understanding, we mobilise and train people every single week and see these kinds of transformations all the time. Sometimes it’s the same day, sometimes a few days and sometimes a few months. However, what we DON’T do is look for someone’s problem where they are experiencing difficulty, because by the time they come to us, everyone else has already done this. They need a new approach, and that’s what we can all provide, where it’s appropriate. Am I saying this is the only way forward? Absolutely NOT! However, if other methods haven’t worked, what I AM saying is this understanding of the human machine is incredibly powerful; life changing for many. What’s going on with the cyclists and their bad knees, I hear you ask? Well, cycling aligns their knees as a hinge joint, so they do exactly what they’re designed to do. In all the cases I’ve seen, the issue is either in the pelvis, the feet, or both, creating poor movement patterns at the knee. 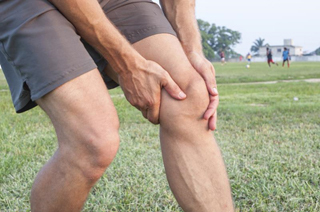 In upright posture the knee then compensates and breaks down. On the bike, it gets to do its own job, not everyone else’s. So, next time someone comes to you with a knee, shoulder, or back issue, remember, it may be worthwhile to look elsewhere! Myers, T. W. (2014). Anatomy trains: myofascial meridians for manual and movement therapists. Edinburgh: Churchill Livingstone/Elsevier.